We continue to work diligently on creating and expanding inclusive cultures. We share data, information and practical examples in order to improve the knowledge and understanding of both women and men in the workplace. Equality, contextual leadership and diversity can all lead to better team work and higher productivity. 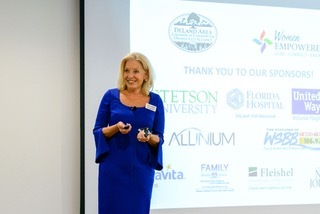 Recently, Susan Elliott-Rink our CEO and leading equality and inclusive leadership expert, presented at the launch event for Women Empowered, an initiative of the DeLand Area Chamber of Commerce and Orange City Alliance. Susan Elliott-Rink presenting "Gender Partnership in the 21st Century" at the launch event for Women Empowered. Read more in the article from The Daytona Beach News-Journal.